Canadian and African scientists are developing new vaccines to combat animal diseases and curb economic losses in sub-Saharan Africa. Some of the vaccines could be used to control similar diseases in Canada. The University of Alberta and the University of Saskatchewan’s Vaccine and Infectious Disease Organization (VIDO) are partnering with researchers in Canada, Kenya, and South Africa to develop vaccines for several aggressive animal diseases. The researchers were awarded grants of almost $7 million from the Canadian International Food Security Research Fund, a partnership between IDRC and the former Canadian International Development Agency, now part of Foreign Affairs, Trade and Development Canada. Globally, economic losses from diseased livestock are estimated at $4 billion, and infectious diseases are responsible for about 30% of animal deaths. 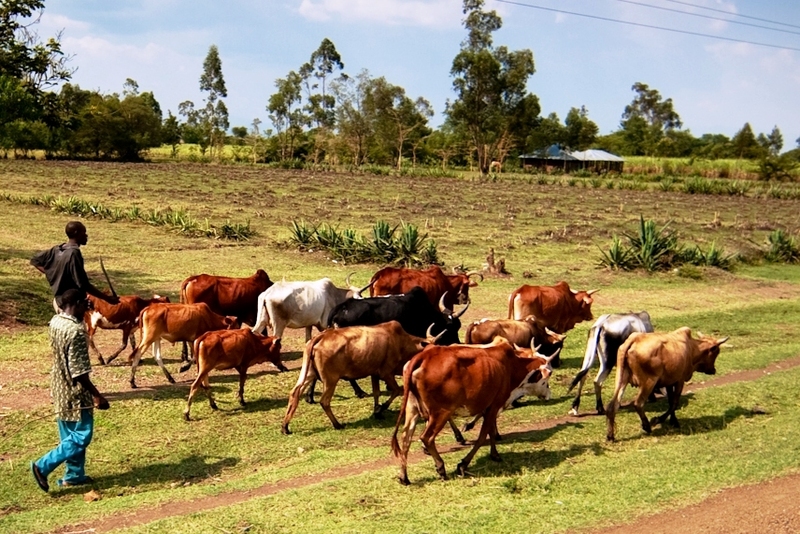 In many sub-Saharan African countries, where livestock production accounts for 25% of economic activity, these diseases threaten livelihoods and food security. In Saskatchewan, a team is busy developing vaccines for controlling contagious bovine pleuropneumonia (CBPP), a bacterial disease that kills up to half of the animals it infects. The disease costs African farmers between $60 million and $300 million annually. Why use a vaccine instead of antibiotics, which are also used against bacteria? It comes down to cost. CBPP could be prevented with a vaccine that can cost as little as 50 cents per animal, says VIDO’s Andrew Potter, a lead researcher on the project. Antibiotics would cost from $10 to $18. Potter says CBPP was once rampant in North America, Europe, the UK, and Australia until it was wiped out in the mid-1900s. Africa remains the only breeding ground for the bacteria. With research teams operating in Saskatchewan and Kenya, the vaccine itself isn’t the only goal. Social scientists at the Kenya Agricultural Research Institute and the International Livestock Research Institute are analysing social and economic factors affecting vaccine adoption – to identify better ways to manufacture and deliver the vaccine locally at low cost. In a second project, researchers from the University of Alberta, led by Lorne Babiuk, VIDO and the Canadian national Centre for Foreign Animal Diseases are working with researchers at the South African Agricultural Research Council's Onderstepoort Veterinary Institute on a variety of viral diseases affecting sheep, goats, pigs, and cattle: animals that are often owned by women and the poor. Lumpy skin disease, sheep pox, goat pox, Rift Valley fever, and peste des petits ruminants cause significant livestock losses for farmers. The collaborative research team is working on a vaccine with the potential to protect against all five diseases at once. At the same time, the project is working to develop the first commercial vaccine for African swine fever, a viral pig disease with high mortality rates. In addition to the research, the team is taking a holistic approach to disease control, producing pamphlets and posters in local languages to help educate farmers about available options for combating diseases and how to properly care for their animals. Both research teams are entering the second year of their 30-month timelines. Reverse vaccinology, or using software to narrow down the search for vaccine components, allowed researchers to identify 80 proteins – from a pool of almost 1,000 – that could be used as ingredients for a CBPP vaccine. Reducing the number of proteins to test, which has become possible only with computers, significantly reduces the time it takes to produce a vaccine. Still, researchers are confident that so far, they’re on schedule. If all goes according to plan, vaccines will be developed, tested, and ready for Phase 2 trials by the August 2014 deadline. Marie-Danielle Smith is an Ottawa-based writer. Team members from Canada, Kenya, and South Africa gather in Ottawa to discuss two CIFSRF-funded animal vaccine projects.